“None Enter Here But In Love, None Leave But In Peace” — original inscription over the door of 510 W. Main St. The Artesia Arts Council and Artesia MainStreet joined forces this week to celebrate the completion of their 510 Building renovation and to celebrate Artesia MainStreet’s 20th anniversary. The 510 Building was built in 1947 as a meeting hall for the International Order of Odd Fellows Lodge No. 11, using adobe bricks and concrete blocks salvaged from an early building in Hope. The IOOF and the Sunrise Rebekah Lodge No. 9 used the hall as their meeting place for many years, as did several other local groups. Ironically, the building’s street number has changed several times through the years, as Artesia refined its numbering system and neighboring buildings came and went — but eventually it was permanently numbered as 510 W. Main St. 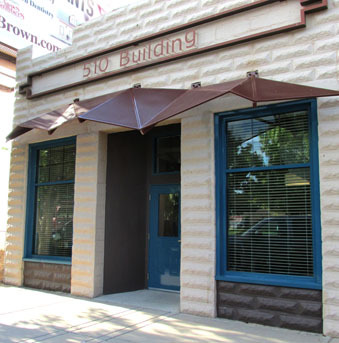 The 510 Building has been owned and operated by the Artesia Arts Council since 1994, and Artesia MainStreet has had offices in it since 2000. The renovation was made possible by a private donation and includes new-and-improved office and meeting rooms for Artesia MainStreet as well as a spacious gallery space. Architect Jose Zelaya, known for many projects in Artesia including the Artesia Public Library, Baish Veterans’ Park, and the Artesia Historical Museum’s new Art Center among others, designed the renovation, working with general contractor Permian Construction. Incredibly, this project is the 140th in our downtown district since Artesia MainStreet was incorporated 20 years ago! The gallery is currently displaying a collection of paintings by Estelle Yates. Estelle was an enthusiastic supporter of the Artesia Arts Council for many years, and her love of art and of the arts is apparent in her works. The gallery is available to rent for events, parties and meetings; for rental information or gallery viewing hours, call the Artesia Arts Council at 575-746-4212.